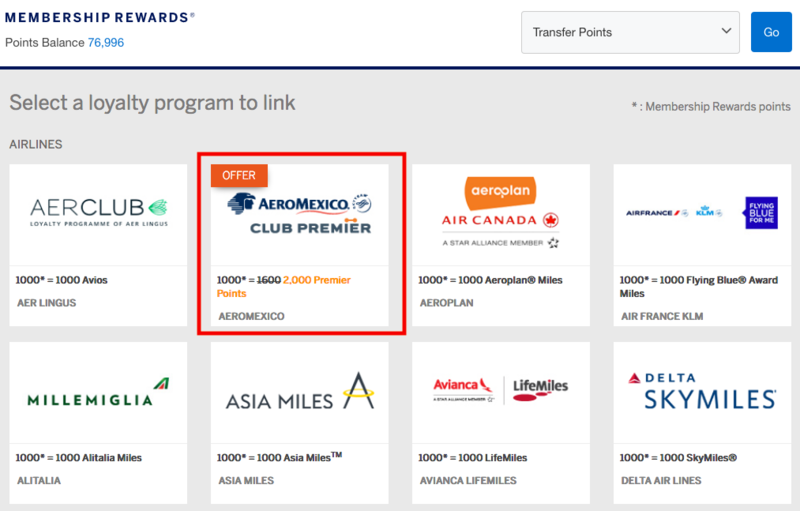 American Express (U.S.) Membership Rewards: 25% Transfer Bonus For Aeromexico Club Premier – Cheap Round the World Tickets! 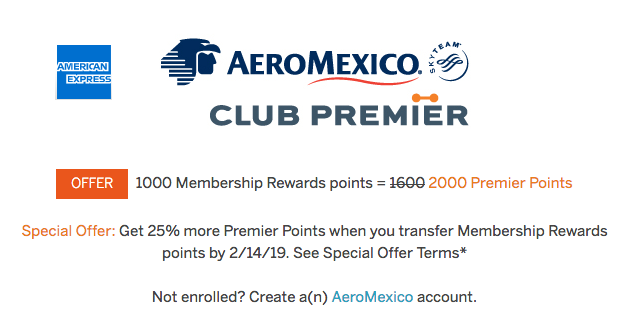 American Express Membership Rewards has a new promotion available for their U.S. based members, offering a 25% bonus on Membership Rewards transfers to Aeromexico Club Premier. This promotion is available to all Membership Rewards members (non-targeted) and expires on February 14th 2019 as the last date to transfer the points, ideal to book a round a world ticket. Contrary to the last transfer promotion with Virgin Atlantic Amex has this time published a proper expiration date of the campaign and also made the transfer promotion available to all customers. The sweet spot with Aeromexico Club Premier might be their Round the World Ticket in Business Class which is priced at 352,000 miles [224,000 miles in Economy Class]. In this case it would only take 176,000 American Express Membership Rewards to book a business class round the world ticket with up to 15 stopovers which is a fantastic deal. Keep in mind that taxes and fees apply when issuing the ticket but Aeromexico doesn’t apply very high fuel surcharges which is a big advantage. This could be a fantastic opportunity for those with enough Amex points in their account to get themselves a nice Business Class Round the World Ticket. The only downside about the SkyTeam alliance is that they don’t really have many award winning airlines in their collection. I’d say that China Airlines, Delta, KLM and Korean Air are the best ones if you manage to find flights with their newest Business Class products. You must be enrolled in Aeromexico Club Premier Program in order to participate in this offer, visit clubpremier.com to enroll. American Express is not responsible for availability of flight, accommodations or any other rewards in the Aeromexico Club Premier Program. Once you have transferred Membership Rewards points, they become subject to the Terms and Conditions of the Aeromexico Club Premier Program and cannot be transferred back to your Membership Rewards program account. Taxes, fees, charges and surcharges, including airline surcharges, apply on Aeromexico redemption flights and upgrades. See Aeromexico Club Premier Program Terms and Conditions for details. Individual air carrier restrictions may apply. Minimum transfer is 1,000 Membership Rewards points. Redeem for this exclusive offer from 12:00 a.m. MT on January 14, 2019 to 11:59 p.m. MT on February 14, 2019 to receive 25% additional Premier Points. Additional Premier Points will be awarded at the time of transfer.